Size: Up to 6" (15cm), usually 4-5" (10-12.5cm). Tank setup: Planted community tank, use a tight-fitting lid as these fish have been known to jump out. Compatibility: Suitable for the community tank, less territorial than some of its look-alikes (see below). Feeding: Omnivore: Will eat most aquarium foods such as sinking granules and wafers, include a strong vegetable component to the diet. Sexing: Unknown, adult males may have a slimmer profile than females. Breeding: No reports of aquarium breeding. 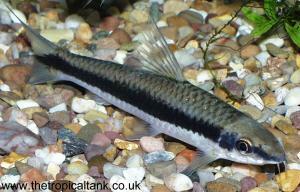 Comments: This fish is a useful algae eater, eating thread algae and the 'brush' algae types ignored by other fish. They also eat planarians (flatworms) which can become a nuisance in aquaria. They can be slightly territorial with their own species, so they are probably best kept either singly, or as a group of 5-6 or more in larger tanks. The "Siamese Algae Eater" normally found in the aquarium trade has previously been referred to as Crossocheilus siamensis, but those found for sale are likely to be Crossocheilus langei, C. atrilimes or possibly an undescribed species. In addition, the Siamese Algae Eater is sometimes confused with other superficially similar species: Epalzeorhynchos kalopterus, usually known as the Flying Fox, and Garra cambodgiensis, usually referred to as the "False Siamese Algae Eater".